At least 26 people, many of them children, have been killed in air strikes on a rebel-held village in north-western Syria, activists say. A school complex was reportedly among several locations targeted in the village of Haas, in Idlib province. It was not immediately clear if the raids were carried out by Syrian government or Russian warplanes. State media quoted a military source as saying several "terrorists" had been killed when their positions were hit. The UN's children's charity Unicef said 22 children were reportedly killed. "This latest atrocity may be the deadliest attack on a school since the war began more than five years ago," executive director Anthony Lake said. The incident comes as the government and its ally Russia said they would continue a moratorium on the aerial bombardment of besieged, rebel-held eastern districts of the city of Aleppo. "It's horrible, I hope we were not involved. It's the easiest thing for me to say no, but I'm a responsible person, so I need to see what my ministry of defence is going to say," Russia's UN Ambassador Vitaly Churkin said. Meanwhile, Amnesty International said some 300 civilians appeared to have been killed in 11 air strikes in Syria by the US-led coalition in two years. More than 100 civilians were reportedly killed in June and July of this year in three strikes in Aleppo province, the group said. The attack on Haas, about 75km (46 miles) south-west of Aleppo, appears to have been intense and flattened a number of buildings, reports the BBC's James Longman in Beirut. 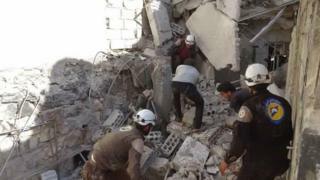 The Syria Civil Defence, a volunteer group whose rescue workers are known as the White Helmets, said a complex containing three schools was targeted. Children were reportedly gathered around an entrance when it was hit, at about 11:30 local time (08:30 GMT). They had been allowed to leave classes early because of the raids elsewhere in the village. Activists shared photographs of dead bodies - many of them children - on the floor of a makeshift treatment centre. The Syria Civil Defence said at least 20 children died in the attacks, while the UK-based Syrian Observatory for Human Rights put the total death toll at 26, including 15 children. Idlib is one of the last strongholds of the Syrian opposition, and the province has been repeatedly bombed by the Syrian and Russian air forces. The US-led coalition against so-called Islamic State (IS) has also targeted rival jihadist fighters linked to al-Qaeda who operate there. Idlib is where civilians from other parts of Syria have been evacuated after being forced to surrender by years of siege and bombardment by government forces. As part of efforts by the United Nations, the people of eastern Aleppo are being offered safe passage to the province, our correspondent says. But as these latest attacks demonstrate, he adds, nowhere in rebel-held Syria is free from violence. Amnesty International has separately called for US-led coalition forces to investigate civilian casualties from its air strikes targeting IS in Syria. The human rights group said it had reviewed publicly available information from local human rights and monitoring organisations, and where feasible interviewed eyewitnesses and analysed satellite imagery, photographs and video evidence to estimate some 300 civilians had been killed. Three of the reported air strikes took place in June and July 2016 in the Manbij area of Aleppo province, which together are believed to have killed more than 100 civilians, including 34 children, in the villages of Tokhar, Hadhadh and Ghandoura. Another struck two houses in the village of Ayn al-Khan, in Hassakeh province, on 7 December 2015. Activists said 40 civilians, including 19 children, were killed. Amnesty said that research and documentation by local groups indicated that more than 1,000 civilians could have been killed by coalition forces since the air campaign in Syria began in September 2014. To date, the group added, the coalition had only acknowledged one single death.